There are tons of things to do near Cherry Creek. Although we always think being on the river is the best choice, below are some other options in the area. 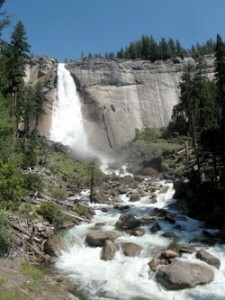 Yosemite National Park: Many people pair a rafting trip on Cherry Creek with a visit to famous and spectacular Yosemite. Hiking, biking, climbing, camping and guided tours are all available within the park boundaries. Yosemite is definitely one of California’s gems and is worth a visit, even if it’s just for a short afternoon hike. A permit is needed to enter the park and can be purchased at any entrance. For a less crowded post-river jaunt than Yosemite, visit Tuolumne Meadows. Or spend a relaxing day at Rainbow Pools, just a short drive up the road from Groveland. After an awesome day on The Creek, enjoy winetasting in the beautiful California foothills. Several wineries are located just a short drive from Groveland. Costello’s Mountain Brow Winery and Vineyards, Sonora. (209) 532-1261. Sierra Repertory Theatre puts on shows in Sonora throughout the summer. Shows range from Romeo & Juliet to Altar Boyz. (209) 532-3120. Stage 3 Theater Company is a newer theater, but they have an outstanding reputation and offer a wide variety of shows throughout the spring, summer, and fall. (209) 536-1778. Black Oak Casino If you are looking for action that doesn’t involve nature or adventure, and you are feeling lucky, you can head to the Me-Wuk Indian casino 8 miles east of Sonora. Groveland Yosemite Gateway Museum and Library features Gold Rush exhibits and information about Yosemite. It is located in downtown Groveland on Main Street (Hwy 120).